Chastened, Mr. Hampton turned his attention back to the freeway. It’s a common scene these days, one playing out in cars, kitchens and bedrooms across the country. Children increasingly rely on personal technological devices like cellphones to define themselves and create social circles apart from their families, changing the way they communicate with their parents. Innovation, of course, has always spurred broad societal changes. As telephones became ubiquitous in the last century, users — adults and teenagers alike — found a form of privacy and easy communication unknown to Alexander Graham Bell or his daughters. The automobile ultimately shuttled in an era when teenagers could go on dates far from watchful chaperones. And the computer, along with the Internet, has given even very young children virtual lives distinctly separate from those of their parents and siblings. Business analysts and other researchers expect the popularity of the cellphone — along with the mobility and intimacy it affords — to further exploit and accelerate these trends. By 2010, 81 percent of Americans ages 5 to 24 will own a cellphone, up from 53 percent in 2005, according to IDC, a research company in Framingham, Mass., that tracks technology and consumer research. Social psychologists like Sherry Turkle, a professor at the Massachusetts Institute of Technology who has studied the social impact of mobile communications, say these trends are likely to continue as cellphones morph into mini hand-held computers, social networking devices and pint-size movie screens. Marketers and cellphone makers are only too happy to fill the newest generation gap. Last fall, Firefly Mobile introduced the glowPhone for the preschool set; it has a small keypad with two speed-dial buttons depicting an image of a mother and a father. AT&T promotes its wireless service with television commercials poking fun at a mom who doesn’t understand her daughter’s cellphone vernacular. Indeed, IDC says revenue from services and products sold to young consumers or their parents is expected to grow to $29 billion in 2010, up from $21 billion in 2005. So far, parents’ ability to reach their children whenever they want affords families more pluses than minuses. Mr. Hampton, who is divorced, says it is easy to reach Katie even though they live in different time zones. And college students who are pressed for time, like Ben Blanton, a freshman who plays baseball at Vanderbilt University in Nashville, can text their parents when it suits them, asking them to run errands or just saying hello. But as with any cultural shift involving parents and children — the birth of rock ’n’ roll or the sexual revolution of the 1960s, for example — various gulfs emerge. Baby boomers who warned decades ago that their out-of-touch parents couldn’t be trusted now sometimes find themselves raising children who — thanks to the Internet and the cellphone — consider Mom and Dad to be clueless, too. Cellphones, instant messaging, e-mail and the like have encouraged younger users to create their own inventive, quirky and very private written language. That has given them the opportunity to essentially hide in plain sight. They are more connected than ever, but also far more independent. In some cases, they may even become more alienated from those closest to them, said Anita Gurian, a clinical psychologist and executive editor of AboutOurKids.org, a Web site of the Child Study Center at New York University. TO be sure, parents have always been concerned about their children’s well-being, independence and comportment — and the rise of the cellphone offers just the latest twist in that dynamic. However it all unfolds, it has helped prompt communications companies to educate parents about how better to be in touch with their children. In a survey released 18 months ago, AT&T found that among 1,175 parents the company interviewed, nearly half learned how to text-message from their children. More than 60 percent of parents agreed that it helped them communicate, but that sometimes children didn’t want to hear their voice at all. 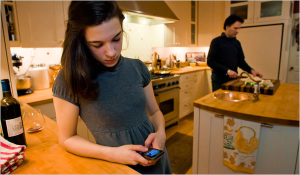 When asked if their children wanted a call or a text message requesting that they be home by curfew, for instance, 58 percent of parents said their children preferred a text. Text messaging, in particular, has perhaps become this generation’s version of pig Latin. For dumbfounded parents, AT&T now offers a tutorial that decodes acronyms meant to keep parents at bay. “Teens may use text language to keep parents in the dark about their conversations by making their comments indecipherable,” the tutorial states. Some acronyms meant to alert children to prying eyes are POS (“parent over shoulder”), PRW (“parents are watching”) and KPC (“keeping parents clueless”). SAVANNAH PENCE, 15, says she wants to be in touch with her parents — but also wants to keep them at arm’s length. She says her father, John, made sure that she and her 19-year-old brother, Alex, waited until high school before they got cellphones, unlike friends who had them by fifth grade. And while Savannah described her relationship with her parents as close, she still prefers her space. At first, John Pence, who owns a restaurant in Portland, Ore., was unsure about how to relate to his daughter. “I didn’t know how to communicate with her,” Mr. Pence said. “I had to learn.” So he took a crash course in text messaging — from Savannah. But so far he knows how to quickly type only a few words or phrases: Where are you? Why haven’t you called me? When are you coming home? Early on, Savannah’s parents agreed that they had to set rules. First, they banned cellphone use at the dinner table and, later, when the family watched television together, because Mr. Pence worried about the distraction. “They become unaware of your presence,” he said. Mr. Pence is well aware of how destabilizing cellphones, iPods and hand-held video game players can be to family relations. “I see kids text under the table at the restaurant,” he said. “They don’t teach them etiquette anymore.” Some children, he said, watch videos in restaurants. Other families face similar challenges. In 1999, Marie Gallick got a family plan for her and her three children and found that each of them had a different approach to cellphone use. One of Ms. Gallick’s sons likes to talk, she said, while her other son, Brandon, who lives near her home in Raritan, N.J., preferred to text. How much they communicated with her, she said, depended on their mood. And she found she had to be careful about what she said and how. Brenda Ng, vice president for consumer insights at T-Mobile, the cellular provider, said her company’s studies show that while cellphone use can cause division, it, too, is “the glue” that cements relationships. “It may seem mundane, but they keep people together,” Ms. Ng said. Ms. Gallick appreciated the message. “I like it when he does that,” she said. “It makes me feel special.” But again, the unintended consequence was more miscommunication for her. In fact, texting appears to be easier than talking for some cellphone users, providing yet another distraction for them inside their cars. Mr. Blanton at Vanderbilt, like many of his peers, texts his mother and friends even when both of his hands should be on the steering wheel. MS. TURKLE, the M.I.T. professor, says cellphones offer another way for the Facebookgeneration to share every life experience the second it unfolds. Ms. Turkle recalled a vacation with her daughter in Paris, where she hoped to immerse her in the local culture and cuisine. “Part of the idea of Paris is being in Paris,” Ms. Turkle said. But during an afternoon stroll, her daughter received several calls and text messages on her cellphone from friends back in Boston. Her daughter, she said, felt compelled to return every one. It is a new sensibility on many fronts. Jan Blanton said her relationship with her son, Ben, is closer because cellphones make reaching out so simple. And that has caused her to reflect on her relationship with her own parents. It is likely that in just a few years, younger members of the digerati will consider cellphones like those the Blantons are using to be relics. While many consumers have become fashion-conscious about the latest in technological devices, analysts say that young children and teenagers are particularly so and more likely than their parents to continually gravitate to something new. Mr. Hampton said his daughter Katie recently asked for a BlackBerry so she could better send e-mail to her friends and have unfettered access to the Internet.